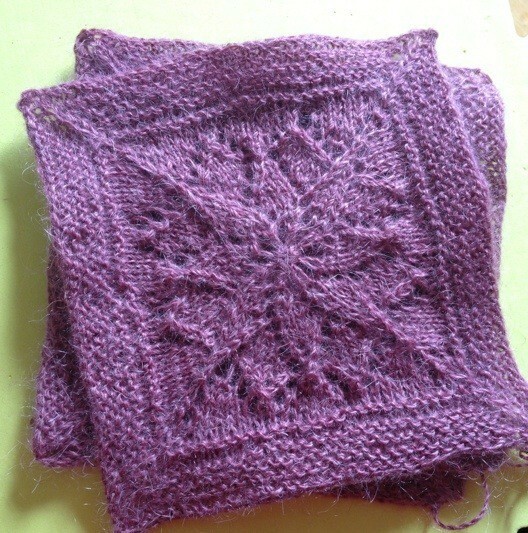 I have become a bit of a square knitter. 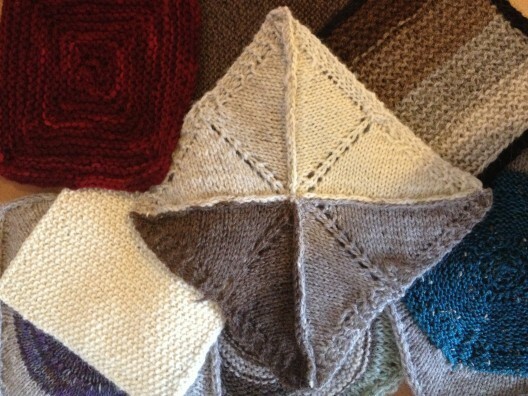 Not the boring kind of square…knitting is never boring! 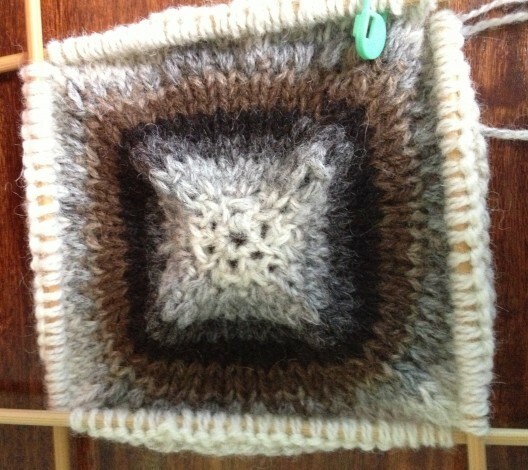 I have been using up my odds and ends for squares and I have also been knitting squares for the Vivid Blanket. When I received my first delivery from Foula Wool – neat little, springy, soft 25g cakes – they were just begging to be played with in a fun way. I also had a few other Shetland ends, from Jamieson & Smith and Shetland Organics – these weren’t really enough for much, but my imagination bubbled and so began Hwaarl, using a trinity of Shetland wools! Taking my inspiration from the POP Blanket squares I made a few mods to make a larger squares (about 8.5 inches). I love the statement of the colourful original and I knew that the Shetland colours could provide a similar effect. The Foula Wool has lovely characteristics and its a lovely plump yarn, but, of course, I appreciate all the wool in this project! Shetland wool is so deliciously sheepy and I adore the texture. The fact that all the wool was grown and sold in Shetland is also massively wonderful…truly local wonderfulness! You can read more about Foula Wool in a previous blog. There is also a lovely short film of the Foula sheep being hand clipped. Check out the beautiful, natural colours! Being Shetland wool, it had to have a Shetland name. Hwaarl is the dialect word for that lovely curl of hair at the crown of the head, that’s a good symmetry, I think. 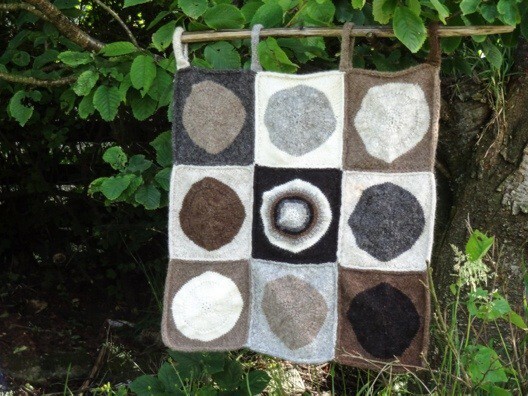 I was sure that I wanted the finished item – 9 squares stitched together – to be part of a cushion OR a wall hanging, one useful and decorative, one just decorative. I thought that I would have made up my mind by now, but I haven’t! Probably a good reason why I finished this ages ago, but haven’t posted a blog…. I was waiting to see if I made a firm decision! I have made it into a wall hanging – thanks to a bit of driftwood – but that’s not to say it won’t be re-purposed in the future! 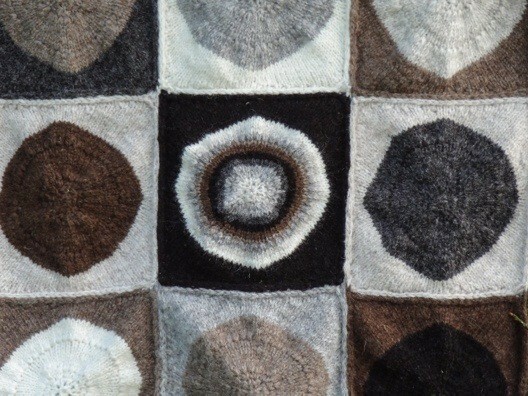 The best thing about wool is that it is always re-customisable! I might hang it over the bed, or above my fireplace in the kitchen, but it may become a floor cushion yet! As an aside, if you like the Pop Blanket and Tin Can Knits, I do have a little giveaway you might be interested in! It looks terrific – I particularly like that centre square. At Woolfest, I bought the mini-skein pack of all the new Titus colours and I’ve been thinking of using them for the Vivid blanket with maybe Coal as the border colour. But now I’m thinking I need to do something with all natural, undyed wool (which I also picked up a lot of at Woolfest). I love the idea of attaching this wall hanging to a piece of driftwood. Yes, I love the central one too – it’s all the colours in the whole thing. You cannot beat the natural colours… Although…. I think with bright colours it would look great in a child’s room! 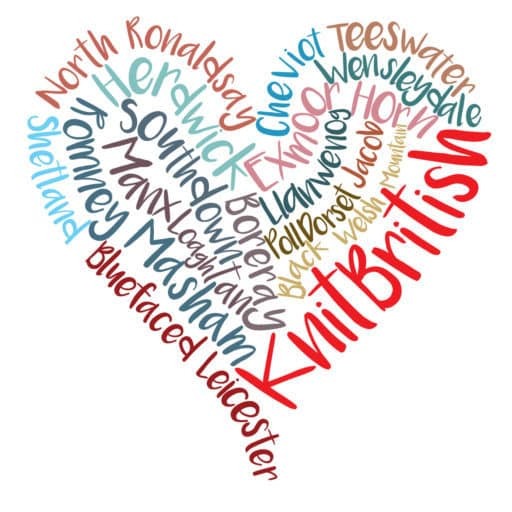 I found your podcast on ITUNES listening right now to the first podcast.I love the idea of Knit British.I am in Australia but I am from Alaska.I am very interested in Shetland Wool and lace knitting.I have been to the UK and fairly far north in Scotland , but sadly not to Shetlands Yet.I am also a novice spinner.. tho I am in Western Suburb of Sydney and I have NO spinning community here..I am looking tho..
Hi Sally, great to hear from you! 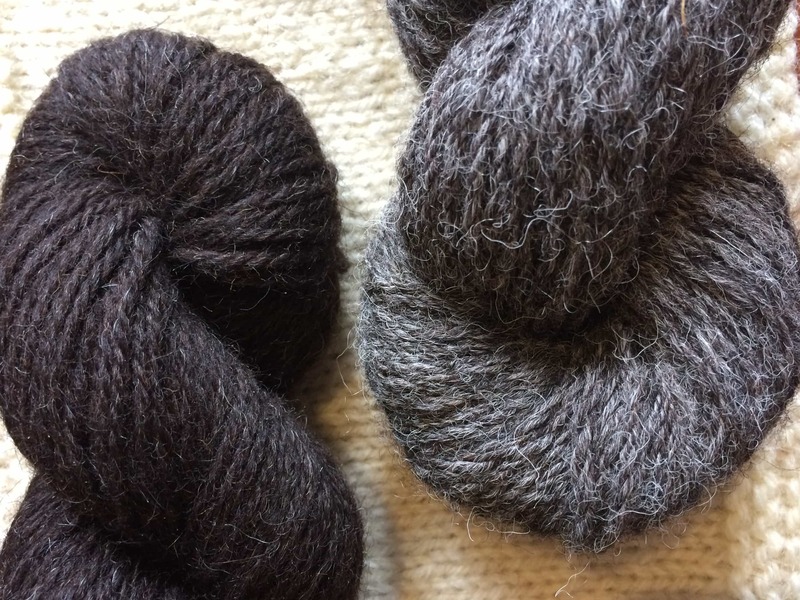 Have you heard of Jamieson & Smith aka Shetland Wool Brokers? They are the source for Shetland wool from Shetland and ship internationally (they have a great international reputation) everything from fibre to yarn. 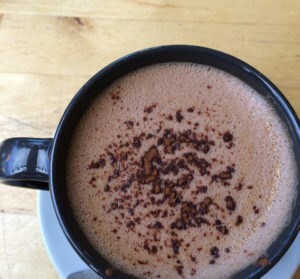 Recommend them highly! I have heard the name, and I have more ideas from listening to all your podcasts! 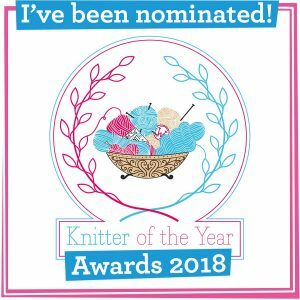 !.I need to explore Ravelry as well as I am brand new to Ravelry.Thank You for your kind response.. I just feel a bit disconnected from my fibre community I had in Alaska ..Ive been gone nearly 2 years .My besty there is a knitter for a Quivit company that sells smoke rings ( cowls essentially) Scarves and gloves from the luxury Musk Ox fibre.Some scarves are hand manipulated on knitting machines but smoke rings and gloves are knitted by hand and all the things are wonderful and very very dear! !.I am not that level of knitter or spinner but feel very fortunate to have learned some from the traditional native Alaskan lace knitters as well.